DURANGO, Colo. – Anticipating the “chilly” days of autumn, Steamworks Brewing Co. will reprise the flavorsome “Molé Stout” for its monthly showcase of unique hand-crafted beers: Firkin Fridays. The keg will be tapped at 3 p.m. on Friday, Oct. 5, 2018. 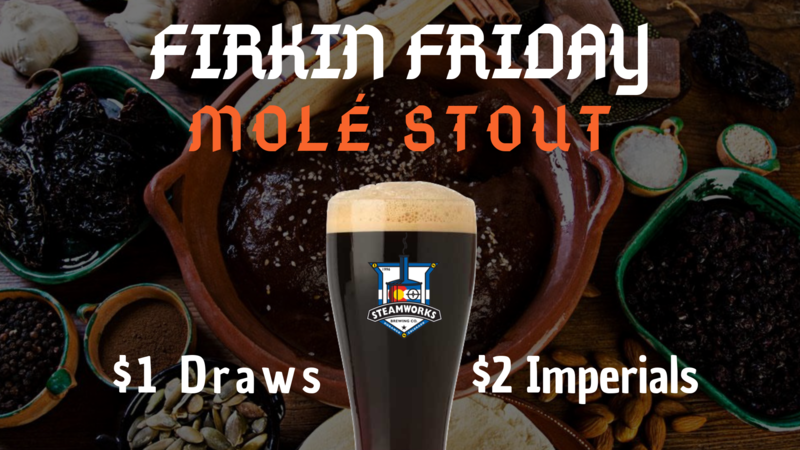 The Molé Stout firkin evokes the essence of chocolate traditional in the Mexican molé sauce. The base of the firkin is Steamworks’ award-winning Backside Stout, a moderately hopped dark beer, with a complex malt and oat flavor – sweet with chocolate and roast overtones. According to Martin, the addition of just the right amount of brewer’s oats is detectable in the smooth, silky finish. By definition, a firkin is an old English unit of volume,typically a wooden cask equal to approximately one-quarter of a regular barrel, or nine/ten gallons. The word “firkin” is derived from the Middle Dutch word vierdekijn, which means “fourth” as in one-fourth the size.